This post is highlighting content areas for The Future of Facebook project, a six-part video series exploring the impacts of social networking technologies on our lives and business. Image designed by the fabulous Erica Glasier. Social networks are a tool for activism and civic engagement, as well as a means of control, manipulation, and surveillance. What is the role Facebook will play in local and global political processes? In an aspirational future scenario, we can imagine Facebook as a place that would encourage political transparency as well as civic engagement. For political candidates, it would be a channel to communicate one’s platform, discuss issues in a fashion that is more peer-to-peer oriented, and understand public sentiment. For governors and officials, it would present an opportunity to be engaged in rapid feedback loops with one’s constituency by offering instant voting, or even creating referendum mechanisms to augment the government decision-making process. For citizens, we could make microdonations to support campaigns with the ease of a clicking a “like” button and express the actual needs and desires of communities. As we’re seeing with Iceland’s bold move to crowdsource its new constitution, there is a level of public participation that is now possible via Facebook and other social media channels that transforms what we understand as governance. At the same time, non-democratic societies are doing what they can to ban and block this potential. Giving a voice to the people is seen as a threat, and political transparency unfavorable. 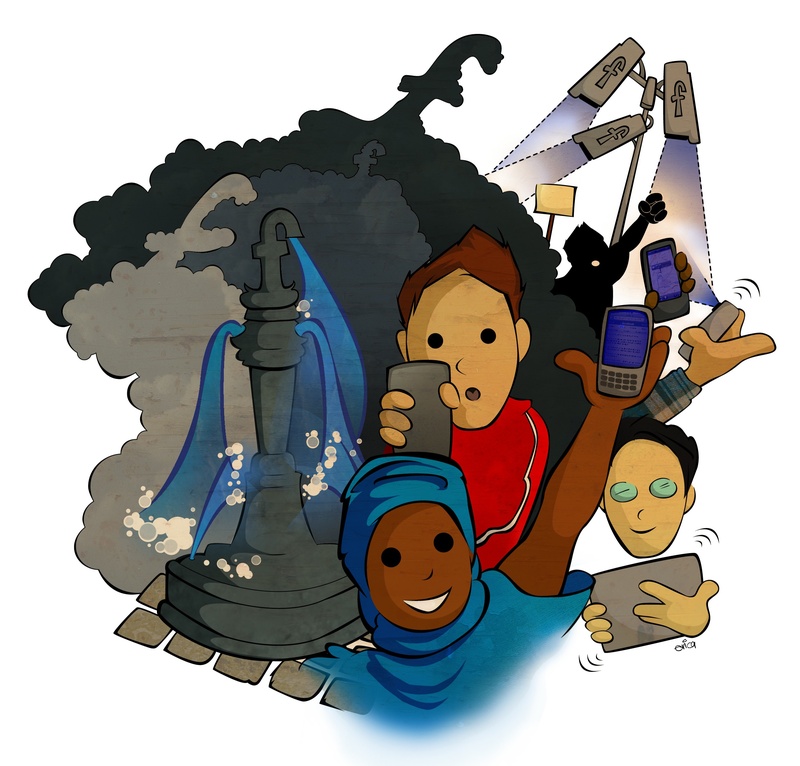 Tensions run high as activists use the same platforms for self-organizing as the secret police use to monitor activities, as has been reported in Egypt, Syria and Libya. In the most frightening scenario, Facebook becomes a convenient Skinner Box for governments to inject rhetoric, manipulate and influence its populations, as well as learn the alliances of dissenters. “Having this kind of information of who trusts who can be very dangerous in the wrong hands,” explains social network analyst Valdis Krebs. What responsibility does Facebook have to protect its users from mortal harm? Will they bend when governments demand deeper access in order to identify influencers and hubs of information? After all, mapping the social graph and controlling a population go hand in hand. As political implications of a massive social network like Facebook become more obvious, the company will be faced with some tough decisions. Will they act as a liberation technology, empowering collective action and showing a commitment to transparency, accountability, and exposing corruption and oppression? Will they serve as a tool for civic engagement and direct democracy? Or will they be forced into regulation, serving as yet another tool for governments to monitor and control the thoughts and actions of its people? Liberator. The democratization of information will create its own transparency standard and force people to adapt or adopt. Those that embrace this transparency will only grow more credible and stronger. Competition in its purest form. As Seth Godin asked, are you adapting or adopting? I appreciate the transparency of this study. I have to believe that these social platforms can and will be used for the good. There was a time when I hesitated to join in, but when we don’t connect we don’t grow. Facebook and others like it will liberate some and leave others behind. I just read Clay Shirky’s latest piece on news provision (http://www.shirky.com/weblog/2011/07/we-need-the-new-news-environment-to-be-chaotic/) and it is interesting to note the parallels in the questions you pose here. In both cases, at issue is a profit-seeking corporation that finds itself the provider of an “unprofitable” public good. I don’t mean that either is necessarily unprofitable, but that the profit motive and the public good motive do not necessarily align. It would be difficult to argue that much in the way of change comes from voting these days, informed populace or otherwise. The machine simply has too much momentum. Facebook provides an entirely different model – organization from the bottom up initiated by the people who care most. Perhaps news is no longer what it once was. As the infamous quote says: If the news is important enough it will find me. And, provided something like Facebook exists, once the news finds us we will be able to organize and act ad hoc. there is only one collective mind … technology externalizes it .. everything in any one mind is in the collective mind ..